On March 13, 2013, the U.S. House of Representative held a hearing on U.S.-India Trade Relations. Among the several topics under discussion were “the issuance of compulsory licenses, patent revocations, and other policies on pharmaceuticals” in India. The hearing was held in the Trade Subcommittee of the House Ways and Means Committee, under the new subcommittee chair, Devin Nunes, a Republican from the 2nd District in California. The title of the hearing was “U.S.-India Trade Relations: Opportunities and Challenges,” and it featured testimony by Roy Waldron of Pfizer, and four other witnesses who mostly focused on other topics. I have provided a youtube.com video of the exchanges that involved Waldron. The video of the entire hearing is available here. Waldron’s written testimony included a variety of complaints about the India patent law, focusing on the failures to obtain patents for some products, including those denied under Section 3(d) of the India patent law, the India system of pre-grant opposition to patents under Section 25(1) of the India patent act, the Nexavar compulsory licensing case under Section 84 of the India patent act, the requirements for local manufacturing, and the new proposals to grant compulsory licenses under Section 92 of the India patent act. Waldron also asserted that India had not complied with TRIPS requirements for the protection of test data, and complained that drug regulatory authorities did not block drug approval where there are assertions of patent protection. The Committee appeared generally sympathetic to the Pfizer complaints, despite the fact that Waldron made a number of assertions that were wrong or dubious, and Pfizer was recommending actions that would raise drug prices for billions of persons living in developing countries. But there was no consensus on how best to act, even among the witnesses. Pfizer was asking that the U.S. government “review all available policy tools in light of India’s deteriorating intellectual property environment,” including increases on tariffs on goods from India. Other witnesses urged caution on measures that would be seen as unilateral trade relation, and recommended that the U.S. engage India in broader trade discussions. Pfizer referred to the WTO dispute resolution option as a blunt instrument with unintended consequences (19:50). KEI has repeatedly asked USTR why it continues to assert that India’s laws on patents or drug registration are not consistent with the WTO’s TRIPS rules, while it declines to bring a dispute before the WTO, and we assume this is because the U.S. thinks it would lose the case. The fact that the US never litigates its complaints against India in the WTO permits it to continue to exaggerate or lie about the WTO obligations on India and other countries, and to seek other more political methods of achieving its objectives. Some of the witnesses at the hearing seemed uncomfortable with the idea of the pharmaceutical industry having an excessive amount of influence on U.S./India trade relations, sensing that there are limits to U.S. influence, and too much attention for Pfizer’s efforts to keep drug prices high in India would have consequences for other industries that were trying to expand trade with India. 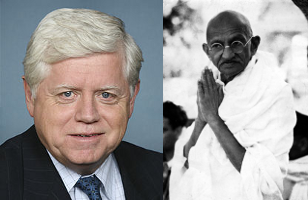 At 14:50 in the video clip, Representative John Larson (Democrat representing Connecticut’s 1st Congressional district) had the surprising idea to quote Gandhi in connection with Pfizer’s recommendation that the United States government pressure government officials in India to raise prices of drugs for cancer and other illnesses. In the context of Mr. Waldron’s testimony, this was an appalling choice.